BERKELEY, George. 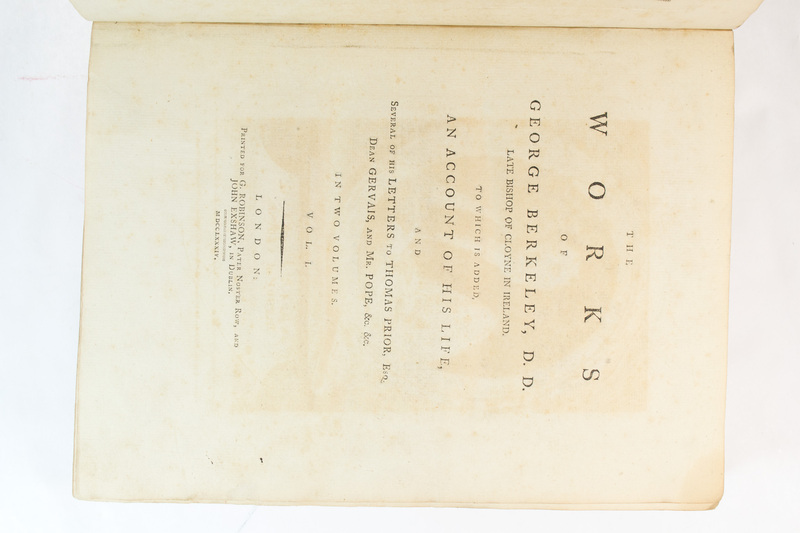 Works of George Berkeley, D.D. Late Bishop of Cloyne in Ireland. London: Printed for G. Robinson, Pater Noster Row , 1784. 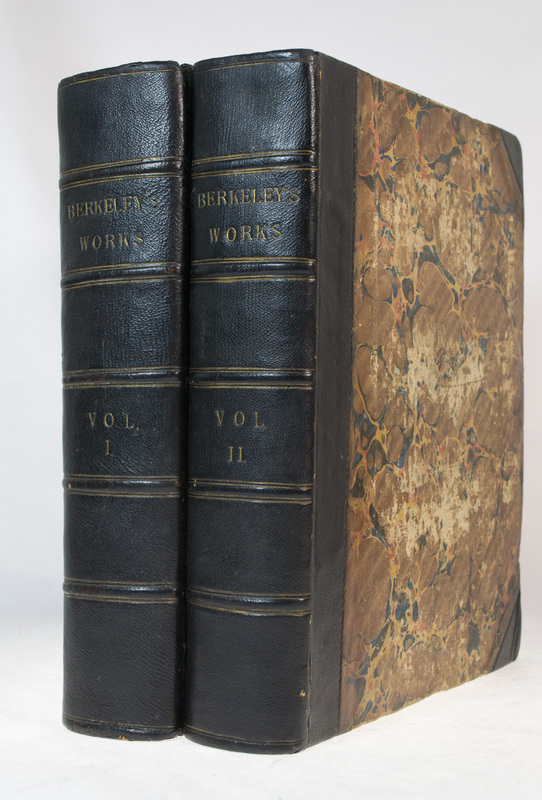 First London edition of Berkeley’s Works,combining his philosophical, scientific, mathematical, moral, political, and theological works. Two large quarto volumes (11 1/2 x 9 1/8 inches. , ci, [1, blank], 646; , 641, [1, blank], *643-*666, -663, [1, blank] pp. Engraved frontispiece portrait by T. Cooke, folding engraved plan (“The City of Bermuda Metropolis of the Summer Islands’), engraved diagram on p. 120 in Volume II, woodcut diagrams in the text. This work (Keynes 143) is the same as the Dublin edition (Keynes R142) with new title page for London market. As well as plates, a number of in-text illustrations. Contemporary marbled boards, rebacked to style in the mid 19th century, spine gilt-stamped with five raised bands. Previous owner's bookplate's on front pastedown of both volumes. Minor foxing throughout. Covers a bit rubbed. Overall, a very good copy. In philosophy, Berkeley provided a link between the period of Descartes and Locke and that of Hume and Kant. “The principle which underlay all Berkeley’s philosophical writing was based on a rejection of all speculation, such as Locke’s, about the meaning and necessity of matter as a primal necessity to any theory of human understanding. Briefly, Berkeley maintained that no existence is conceivable or possible which is not conscious spirit or the ideas of which such a spirit is conscious. This presupposes complete equation of subject and object: no object and exist without a Mind to conceive it. Without the pre-existence of the Mind, matter and substance, cause and effect, can have no meaning. In the Principles, externality absolutely independent of all mind is shown to be an unreal, impossible conception: true substance is the conscious spirit and true causality the free action of such a spirit. Physical substance and causes are relations among phenomena, arbitrary though (by the action of the Mind) constant. Connexions between them are viewed subjectively as the suggestion or associations of the human mind, and objectively as the operation of the Universal Mind. Thus the universe is the sum of human experience, and form a symbol of the divine universal intelligence: esse est percipi” (Printing and the Mind of Man). Besides Berkeley’s most celebrated explorations of perception, as expressed in Principles of Human Knowledge, his “more general aim in these writings is to show that the goal of science can be no more than describing phenomena through the laws and theories(‘hypotheses’) of science that govern them, and thus to trace the ‘grammar’ or ‘language of nature’ without intervening concepts, at least insofar as these concepts might be construed existentially or as sources of ‘active power’, which in Berkeley’s terminology would amount to giving an ‘explanation’” (D.S.B.). Also included in the Works is his enlightened social project for the Americas, where education and spiritual provision would be freely available to all, and the native population would be converted to a benevolent Christianity. Jessop 142. Printing and the Mind of Man 176 (the 1710 edition of A Treatise concerning the Principles of Human Knowledge). Keynes R142.